You have a great gallery Jeff, probably too great because I've seen other peoplr taking credit for your work. Oh, I LOVE this scene...looks like paradise. 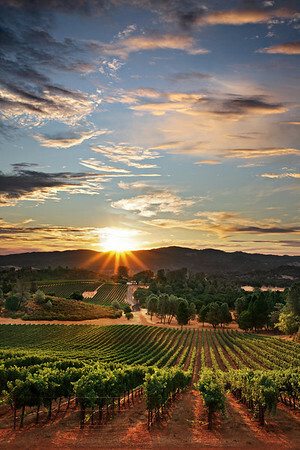 What a wonderful combination of things, the sunburst, the symmetry of the vines, the mountains and other fields. Just gorgeous! Roxanne, to answer your question on the starburst, you just stop your lens down to F/22. Be sure to bring your exposure back up to proper setting though. Cheers. Everything perfectly in its place. Beautiful shot - of course, I could just copy and paste "Beautiful shot," on all your photos - they are all wonderful. Excuse the novice in me, but is there a trick to getting the sun's rays to look like they do in your photo? Wow, this is a beautiful shot Jeff! Great light, composition and scene.